Zoom: How do I end a session? How do I schedule a videoconference session? How do I enable/disable popup notifications? 1. When you log into the website, you will automatically land on your Dashboard. If you have navigated to another page, just click on the "Videoconference" tab along top of your browser window to get back to the Dashboard. Romeo and Friar Lawrence are not online. Juliet has entered the waiting room and is ready to be connected to. 3. Click on the "Enter Meeting" button when you are ready to launch the meeting. (It may take up to a minute to finish connecting to your participants.) Once a meeting has been started, any other invitees will be automatically added to the meeting when they arrive, without further action by you. Depending on your browser, you may be prompted to confirm that Zoom is allowed to launch. 4. Once connected, you'll be prompted to choose how to enable your audio. Click "Join Audio by Computer" to use your computer's microphone and speakers. 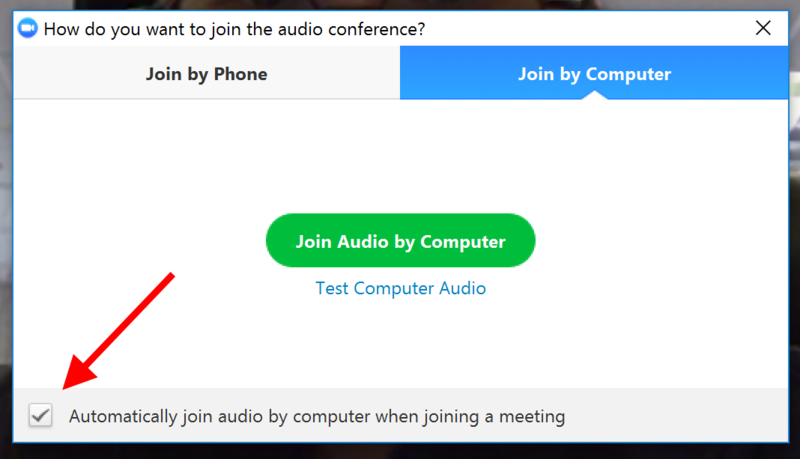 TIP: Check the box next to "Automatically join audio by computer when joining a meeting" before clicking "Join Audio by Computer" to avoid having to confirm this every time. 6. If you do not click “Join audio by computer” then your participants won’t be able to hear you and you also won’t be able to hear them. To fix this while in session, click “Join Audio” in the lower left hand corner." This article was last reviewed by our Support team on July 24, 2018.